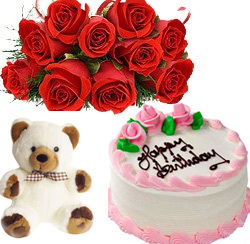 Wish your loved ones by gifting this delight combo,this hamper includes 12 red color roses bouquet,delicious cake with choice of your flavour and cute teddy bear height 10".Best combination of gift for any age. Delight Combo is a delightful gift hamper consisting of a bouquet of multicolor roses, delicious cake of the flavor of your choice (Vanilla, Strawberry, Chocolate, Pineapple and Butterscotch) and a cute 8 inch teddy bear. Our creative florist has arranged 12 red roses beautifully in a bouquet. Roses portray your feelings with their colors; send roses bouquet online and send your message to your loved one. Our fresh multicolor roses make strong statements on any occasion be it birthday, wedding day, anniversary, baby showers, retirement and other delightful occasions.